Portland Place is a street in the Marylebone district of central London. Named for the Third Duke of Portland, the unusually wide street is home to the BBC Broadcasting House, Chinese and Polish embassies, and the Royal Institute of British Architects. The Royal Institute of British Architects headquarters, a 1930s Grade II* listed building designed by architect George Grey Wornum, at 66 Portland Place in August 2012. The street was laid out by the brothers Robert and James Adam for the Duke of Portland in the 1770s and originally ran north from the gardens of a detached mansion called Foley House. It was said that the exceptional width of the street was conditioned by the Duke's obligation to his tenant, Lord Foley, that his views to the north would not be obscured. In the early 19th century, Portland Place was incorporated into the royal route from Carlton House to Regent's Park via Langham Place, developed for the Prince Regent by John Nash. The street is unusually wide for central London (33 metres / 110 feet). The ambitious plans included a third circus to complement Piccadilly Circus and Oxford Circus known as Regent's Circus; the remains of this plan survive today in the wide space surrounding the street's junction with Marylebone Road. Portland Place is the wide street at the top of this 1790s map. At that time it terminated abruptly to the south at the gardens of Foley House. In administrative terms, Portland Place lies within the City of Westminster's Marylebone High Street Ward as well as the Harley Street Conservation Area. Langham Place in Charles Booth's 1889 map was a short road which connected Portland Place to Upper Regent Street. Many of the houses are now occupied by company headquarters, professional bodies, embassies and charities (including Arthritis Research UK and the Royal Air Force Benevolent Fund). The landmark headquarters of the Royal Institute of British Architects sits at 66 Portland Place directly opposite the Chinese embassy; for years practitioners of Falun Gong have mounted a silent protest in front of the former and facing the latter. Other foreign diplomatic institutions include the Polish Embassy, a Portuguese consulate, the High Commission of Kenya, the Swedish Ambassador's Residence and the Colombian Consulate. In addition, Portland Place remains a fashionable address with some very exclusive blocks of mansion flats. Number 1 houses the Institution of Chemical Engineers, number 41 the Academy of Medical Sciences, number 23 houses the Nursing and Midwifery Council, number 67 the Royal Air Force Benevolent Fund and number 76 the Institute of Physics. The Institute of Physics building replaced two earlier Georgian terrace houses, one of which – number 76 – was the home of John Buchan, the author and politician who lived there from 1912 until 1919, which resulted in Portland Place being the London home of Richard Hannay, the hero of Buchan's most famous novel "The Thirty-Nine Steps". Its northern end opens into Nash's elegant stucco semicircular Park Crescent, which in turn leads on to Park Square and Regent's Park. There are two landmark buildings at the south end of the street, although both are technically in Langham Place: the grand late Victorian Langham Hotel, and Broadcasting House. Langham Place is a short road which connects Portland Place to Upper Regent Street, although on the ground they all appear to be one street. A Grade II listed memorial to Quintin and Alice Hogg erected in 1906 stands opposite Broadcasting House at the south end of Portland Place. There are a number of international independent schools on Portland Place, including Abercorn Upper School, Queens College and the Southbank International School. Portland Place was the home of Jane Gamble, the character on whom Henry James based his novel The Portrait of a Lady. Jane Gamble was also the real-life subject of My Courtship and its Consequences by Henry Wikoff. Portland Place was the London address of Adam Verver and his wife, the former Charlotte Stant, in the last complete major novel by Henry James, The Golden Bowl. Portland Place is the home of Richard Hannay in John Buchan's novel The Thirty-nine Steps. Portland Place is the home of Stephen Jones in H. P. Lovecraft's short story "The Horror in the Museum". Portland Place is featured in Daphne du Maurier's novel Julius. Portland Place is the location of the private hotel where Valeria and Eustace stay after their truncated honeymoon in The Law and the Lady by Wilkie Collins. Portland Place is a metaphor for Septimus Warren Smith's view of the world as a strange but wonderful place in Virginia Woolf's novel Mrs Dalloway. ^ Taggart, Caroline (2012). The Book of London Place Names. Random House. p. 134. ISBN 9781448146642. Retrieved 4 April 2018. ^ Norrie, Ian; Bohm, Dorothy (1984). Walks Around London – A Celebration of the Capital. London: Andre Deutsch. ISBN 0-233-97979-4. 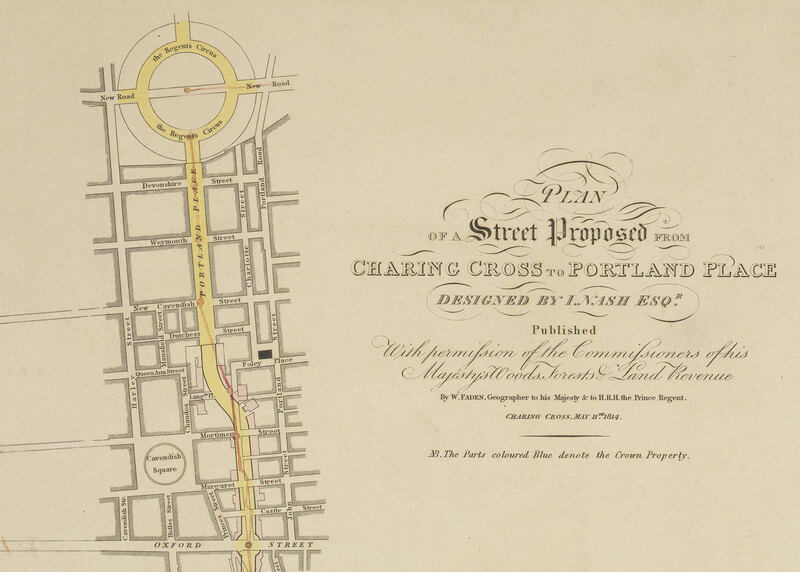 ^ Plan of a Street Proposed from Charing Cross to Portland Place (Map). Commissioners of Woods and Forests. 1811. Archived from the original on 21 November 2016. Retrieved 21 November 2016. ^ "Harley Street Conservation Area Map September 2007" (PDF). Westminster City Council. Archived (PDF) from the original on 28 July 2011. Retrieved 21 May 2010. ^ Historic England. "Statue of Quintin Hogg (1226993)". National Heritage List for England. Retrieved 1 December 2014. ^ Woolf, Virginia (1981). Mrs. Dalloway. New York: Houghton Mifflin Harcourt Publishing. p. 83. ISBN 978-0-15-662870-9.